In the bowl of your stand mixer, combine honey, yeast, and water. Set aside until foamy, about 10 minutes. Add the flours and knead with the dough hook until the dough is smooth and elastic. Add the salt and olive oil and continue kneading until well combined. Form the dough into a ball, drizzle with a bit of olive oil to coat, and return it to the bowl. Cover the bowl with plastic wrap and set aside until doubled, about 60 minutes. Preheat the oven to 350 degrees. Sprinkle some cornmeal on 2 baking sheets. When the dough has doubled, remove it from the bowl, divide it in half, and form each loaf into your desired loaf shape. Place the loaves on the pans, cover with plastic wrap, and set aside until doubled, about 30 minutes. Remove the plastic wrap, slash as desired, and bake at 350 degrees until nicely browned, about 35 minutes. Nice lookin' loaf. 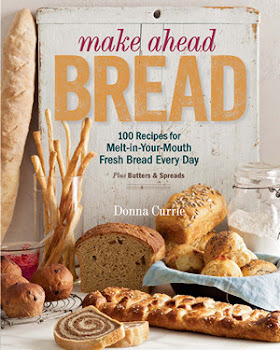 Hey Donna, what kind of yeast do you use? I've used both Red Star and Fleishman's instant. Right now I've got a French brand. A store nearby was going out of business and I picked up a couple 1-pound vacuumed sealed packages of it. I should be good until the end of the year. Since I go through so much of it, I only buy in the 1-pound packages, so sometimes it just depends on where I buy it. The few stores that sell in that quantity don't usually have options. A fresh loaf of bread looking that good calls for a nice Greek salad with lots of olive oil! Yummmmy! I mixed this up today, but the dough was about the consistency of cake batter. I used the kneading hook for about 7 minutes and hand kneaded (well, stretch and fold) another 7, adding about another cup of bread flour and it was still so slack that there was no way to shape it in to a ball. Am I doing something wrong? If you measure rather than weigh your flour, your weights could be different than mine. It also depends on the brand of flour you use. Breads with higher protein levels will absorb more water and be less slack, and protein varies from brand to brand, and sometimes from bag to bag. My normal breads use 2 1/2 cups of flour per cup of water and they're not slack at all, particularly when I use any kind of whole wheat flour. The only thing I can say is that if you need more flour, then you should add it. Thanks Donna, I did measure my flours by weight. I've only started baking breads in the last 2 months or so and still don't have a knack on how humidity can affect flour but I was still surprised to need to add another cup. Thought of something while I was writing this comment. I used a site to convert a 2.5 cups of flour to grams (300g) rather than convert your 13.25 oz (380g). The difference was about 160 grams between the two flours! No wonder it was so soggy! I've been looking for a 50/50 bread that used a direct method rather than a sponge or starter, so I'm not giving up on this one! It would be nice if there was a consensus on what a cup of flour should weigh, but I've seen it anywhere from 4 to 6 ounces. It's difficult to get to the upper or lower ends of that scale, but it's possible. Baked this up again this evening. Much better. Thanks for the great recipe!